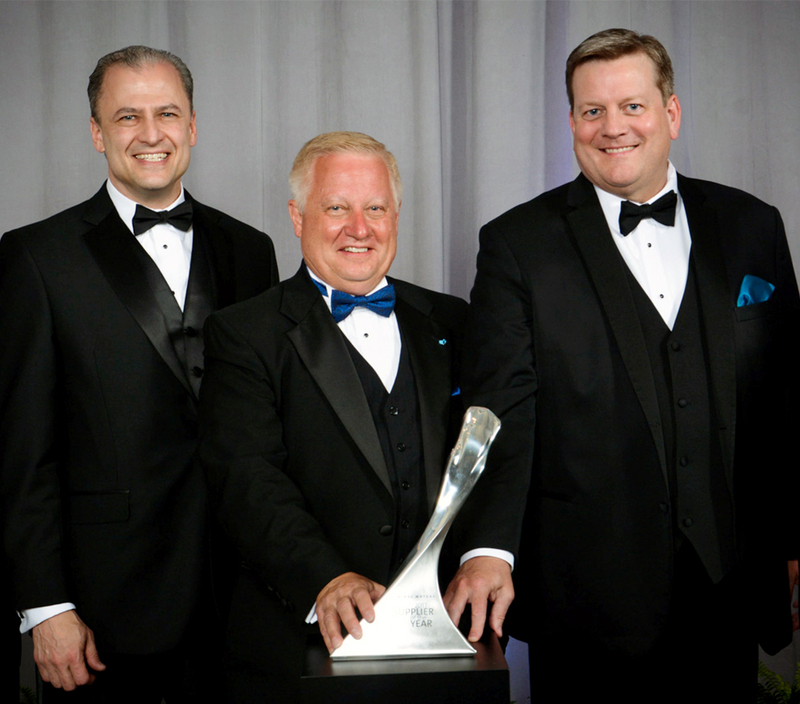 TROY, Mich., May 1, 2018 – Inteva Products, a leading global Tier One automotive supplier of engineered components and systems, has been named a 2017 Supplier of the Year by General Motors. The award was presented during GM’s annual Supplier of the Year awards ceremony held Friday, April 20, in Orlando, Florida. Inteva was one of 132 suppliers from 17 countries to receive the honor this year for consistently creating outstanding value, bringing new innovations to GM, and exceeding expectations for quality, execution, and total enterprise cost. Inteva provides GM with instrument panels, door trim panels, floor consoles, roof systems, latches and InteatherTM TPO material solutions. Inteva’s CEO & President Lon Offenbacher, Sales & Marketing Vice President Gerard Roose, and Senior GM Global Sales Director Pat Eckhout were on hand to receive the Supplier of the Year award. Inteva Products, LLC is a leading global automotive supplier providing automakers with innovative, reliable, environmentally friendly products that enhance vehicle quality, safety and performance. Inteva has global resources for engineering, manufacturing and customer service for Closure Systems, Interior Systems, Motors and Electronics, and Roof Systems. Formed in 2008, the tier-one supplier is focused on achieving sustained global growth, providing excellent customer service and driving innovation. Inteva was founded on innovative solutions and the use of applied technology to drive value-based solutions. Inteva employs more than 12,000 people globally and is headquartered in Troy, Michigan USA. For future company updates, please visit the Inteva Products website, or the company’s Facebook, LinkedIn and Twitter pages.